This firmware is only for Xiaomi Redmi 4 Smartphone with Snapdragon 430 as CPU. Download MIUI8 Android 6.0 Firmware for Xiaomi Redmi 4 2GB 16GB Smartphone from here, here or from here. The Xiaomi Redmi 4 features a metal body and 4100mAh battery which has longer standby time. The Redmi 4 Pro version used Qualcomm Snapdragon 625 processor,the standard version used Qualcomm Snapdragon 430 processor. New MIUI 8 system of Redmi 4 has magical functions such as dual apps and second space. This a new flagship smartphone which cost reasonable price in Redmi series. The Xiaomi redmi 4 features a 5.00-inch capacitive screen display with a resolution of 720 pixels by 1280 pixels,296PPI. On the front, the screen is with curved edges. It can protect your eyes. The eye mode reduces the amount of blue light,promotes sleep and relieves visual fatigue. It brings a comfortable viewing experience. There are three capacitive buttons at the bottom and a motion sensor at the top, as well as speakers and a front camera. 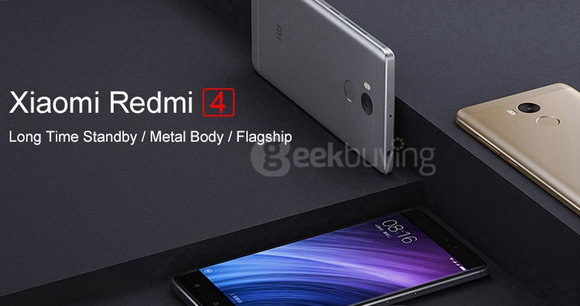 On the back, The metal unibody of Redmi series also used at Xiaomi Redmi 4.Different from the general “three-stage” metal body, Redmi 4 put an piece of aluminum ingot into 30 processes to molding, and with sandblasting technology to make the metal combined with 2.5D glass tightly. Though CNC diamond cutting,the frame of phone body and edge of camera shines brightly. The xiaomi redmi 4’s unibody design means the battery is not removable.